Finally back home with the family. It was a crazy trip and I plan to share all the fun details next week. I just needed to jump back in to doing something creative for our craft day...so that's what we have today. Danger Girl's hair is growing out and she's finally agreed to use some type of hair clip. She just doesn't want anything too girly. I can't blame her. So many hair clips are either completely plain, or flowers, ribbons, bows, etc. Definitely not something Danger Girl would ever agree to wear. With the help of some felt, two small scrapbooking brads and a hot glue gun, I created this cute Domo hair clip. For those who don't know Domo...he's a Japanese anime monster. Next on the anime themed hair clips for the girls...Totoro! That one may take a bit more planning! Oh my goodness I adore this! I wasn't expecting to come across this but I'm so glad I did.. 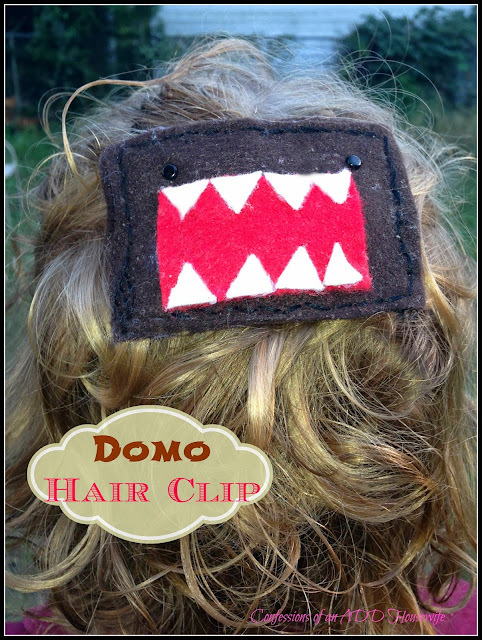 I love Domo and my messy hair DEMANDS clips.. the perfect combo!